If you think I have the answers here, I'm afraid you'll be disappointed. I'm far from having any answers. I'm not superhuman--none of us are (although it seems at times that everybody expects us to be). 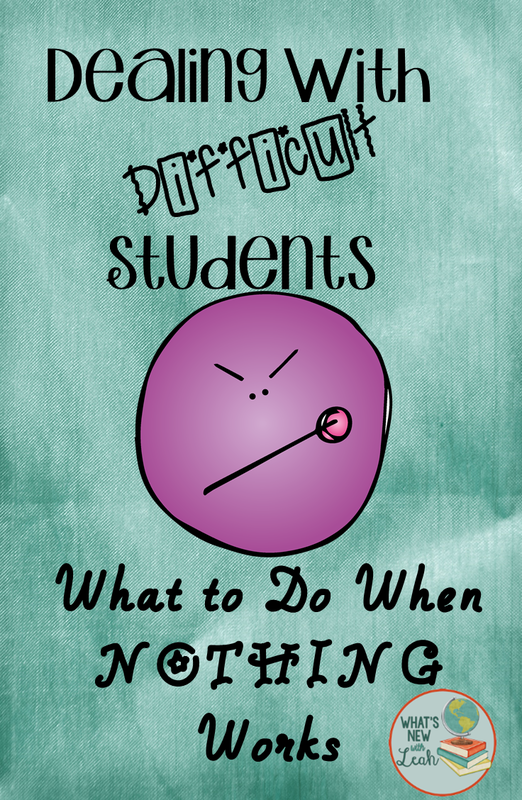 I've been in the classroom for 14 years, and I still have students I have no idea how to help. I create engaging lessons, I get to know them, we play games, I call their parents, I (gasp) write referrals, but nothing works. Case in point--"Thomas" is constantly out of his seat. He bothers everyone around him. He talks to other students all the way across the room. When you correct him, he argues. One second, he's on task and talking (always talking) about how much he loves your class. The next second (after you tell him to knock the volume down a couple of notches) he's talking about how much he hates the class--out of his seat again, texting (a scene when you take his phone--he insists it was his mom)--he stares at his phone in "phone jail" and points and shouts, "She has her phone out," "He's on his phone!" "Man, stop bein' a snitch," the other kids say. I am, of course, speaking from experience. This particular student is like a tidal wave of chaos everywhere he goes. But he's not a bad kid. He's even quite lovable, really. But I cannot let him be a force of disruption in my classroom. That's not fair to everybody else (and everybody else in this particular class has an enormous capacity for disruption, as well). 1. Sent him to my quiet area. This is an opportunity for him to get away and reflect. 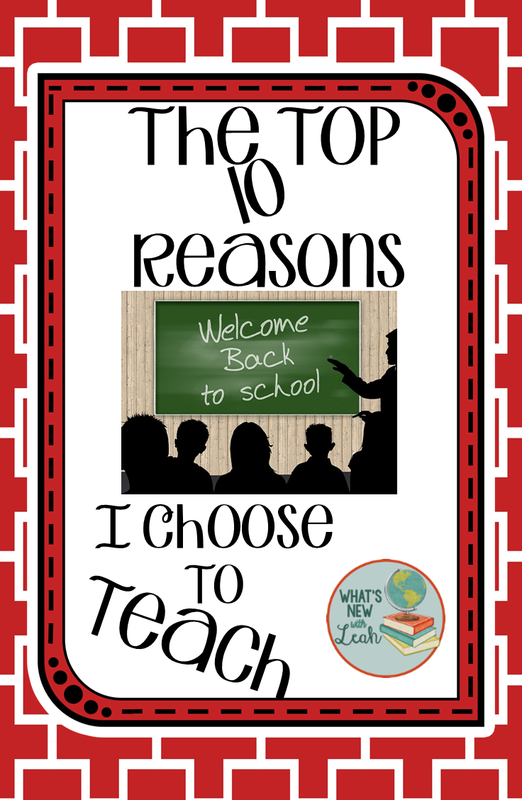 You can download the poster and handout for free HERE to see what I'm talking about. He totally missed the point. Instead of completing a reflection sheet, he completed a page from one of my fourth grade son's math workbooks (I keep one on the shelf at the back of my room so he can practice on teacher workdays). I had to work really hard not to laugh when he handed that one to me because, really, that was funny. 3. Told his coaches (apparently, running laps doesn't phase him). 4. Wrote an office referral. He really didn't care about this, and he complained that I was picking on him. What do I do next? I teach high school, after all. I see a large number of students everyday. We don't do cute behavior incentives--we just don't. But maybe we should? I also don't want to start the flurry of office referrals. I'd like to teach this student (but I can't at the expense of everybody else). So, I'm going to try something that I've only done once before in 14 years--a behavior contract. I've watched him, and I know what his issues are, so I'll fill out this baby I made five years ago, meet with his parents and an administrator, and have everybody sign so that we're all on the same page. The ball's in his court now (theoretically, anyway). I'll put a tally mark in each category each time that the undesired behavior is displayed. How do you deal with difficult students? Leave a comment below to let me know. The student you described sounds exactly like a kid or two in my classes, so I may have to see if such a behavior contract might work for them. Some logistical questions- does the kid keep the contract with him on his desk or do you mark it on a clipboard you have? Do you talk about it/send it home each day or only weekly? Thanks for the idea! Hi, Hannah--I keep the contract on a clipboard. That one is the final say (I don't lie awake at night, dreaming of ways to sabotage my students :)). I also give the student a copy. Keeping tangible track tends to lead to mindfulness of their behavior. I'd send a copy of MINE home every Friday to be signed by Monday. If I don't get it back signed, I'd take the time to call home. I know, it makes my head spin, too, when you multiply that kid by 120. Email me at ljputty@msn.com if you have any more questions! Im a new teacher and i tach theatre in middle school so essentially were all ready a crazy bunch. I am just having a hard time managing the hyper kids. I have an entire class that is mostly girls who are all on the same little cheer team and will not be quiet for the life of them. 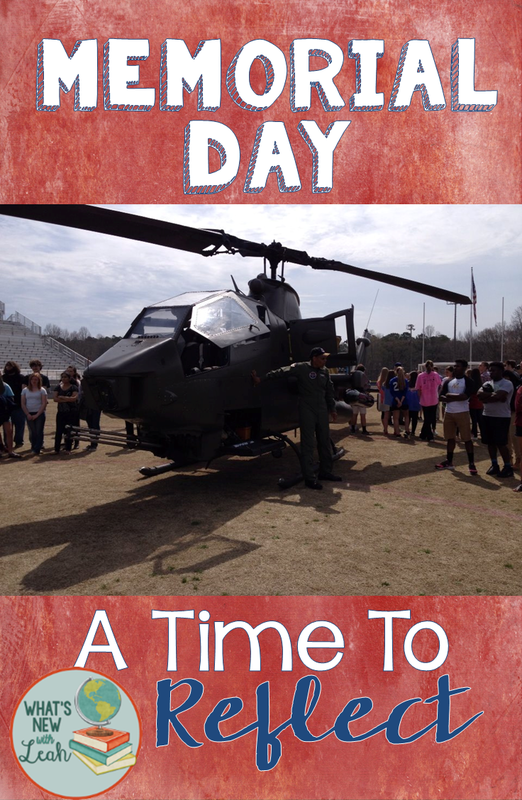 What would happen if you had a one on one conversation with "Thomas" - not during class, but during a time set aside for both of you to focus on the needs of each other? Inviting him (not demanding/not as punishment) to have a conversation with you so he can be aware of how his actions may be affecting those around him (yes, it seems like that's obvious - but to teenagers who live in their immediate world, sometimes it's not or they believe all students feel and think the same way they do, they are just afraid to "act out against the man" like he does) and why he might be behaving this way in the first place. His behavior is a symptom of a deeper set of issues - whether they are home issues, learning issues, self-value issues, etc. Not to make excuses - but to find the problem and workable solutions from there. Charting his behavior is a great step, but without context or knowledge of why he behaves the way he does (which he may not on a conscious level understand) may only be a stop gap measure. Of course a one on one conversation with the student is the first step. That's always very important. The contract is a last ditch effort. OMG the encouragement I needed this week THANK YOU!!!! I would hug you if I could! I have a student or two in my class. 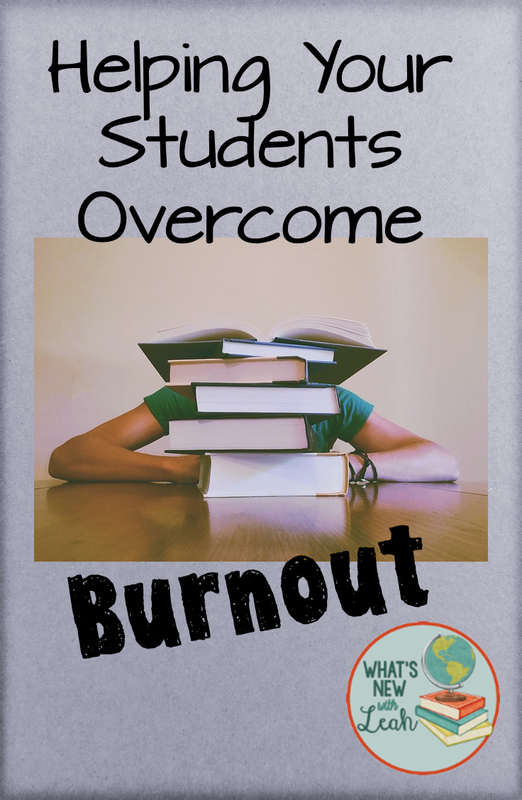 One of them is in a behavior contact that is passed along to his teachers and goes visits the counselor at the end of the day but, it still isn't working. We tried given this student an incentive but once it was received the student wouldn't care anymore in the week and misbehave or wouldn't want the reward the student had chosen for the week. I am a first year teacher and I am running out of ideas on what to do!! We've tried a chart at our school for Positive Behaviors we want to see from the student,so we are focused on what they do that is right, instead of focusing on the wrong behavior. So instead of "being out of seat without permission", we put "raised hand to request to move about the room". "Talking out of turn" could be "Talked at appropriate times" or "Requested permission to Talk", just some ideas. Then at the end of the week, he could get a "prize" for so many good behavior marks, like 10 minutes on his cell phone. I think a chart for positive behaviors is a fantastic way to go, Louann. Bee, maybe you could try that with your student. Don't lose heart--the first year is the hardest. Be sure to seek out lots of support! I teach continuation high school where 75% or more of our students are "Thomases." We started behavior contracts several years ago and through administration it's a hit/miss thing. I really like yours that targets certain behaviors. 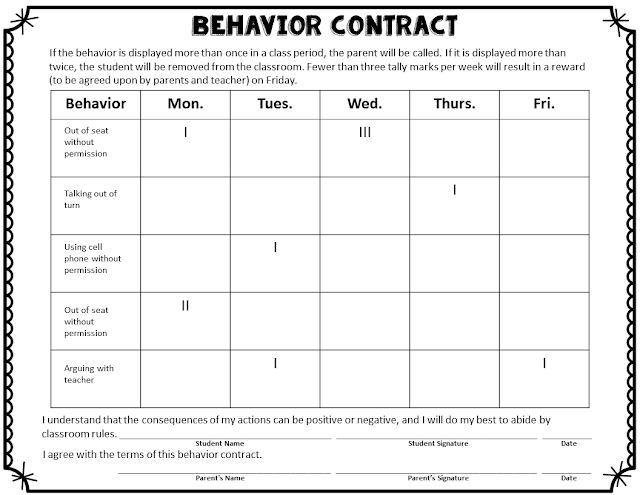 Just to offer something different, our behavior contracts focus on when the student does things right. They get points in four targeted areas (respect, organization, awareness and responsibility...the targets for each one are explicitly taught). The goal is to maintain earning 80% of the points possible (for a set duration) on the contract in order to get off the contract. I like that yours is "in house" and that you take care of it instead of relying on the student to take it back and forth daily. I would have to be very strategic with who I decided to use it with. Thank you for giving us the example as well! Love the chart! Do you have an editable version youdy be willing to share? I teach 5th, so the consequences would be a little different. IdI love to be able to type in the behaviors for my student too. Thanks! I like the positive behavior contract. I have at least two that need it. The one student put the chicken in the story the INTERRUPTING CHICKEN to shame. She bothers EVERYONE'S CLASSES without consequence.